Is my product dangerous goods for transport? This is one of the most common questions in my everyday conversations. There is a simple way to make sure, whether your product is dangerous goods for transport. Document that will help you is the safety data sheet (SDS). In the section “Transport information" under item 14.1 you will find the UN number. In case the UN number is provided, the goods are a subject of dangerous goods for transport. Next to the UN number on the right side, you will also see the characteristic ADR hazard warning labels for obligatory labelling of packaging containing dangerous goods. This method is applicable, if one or two product should be checked. The downside is that you have to review each SDS individually. However, this does not have to be the case. If the SDSs were made by us, you can review all of these products with just a few clicks. First login in the Chemius web application. In the upper right corner, click for settings (wheel icon). Then tick off the “UN" option and save the settings. 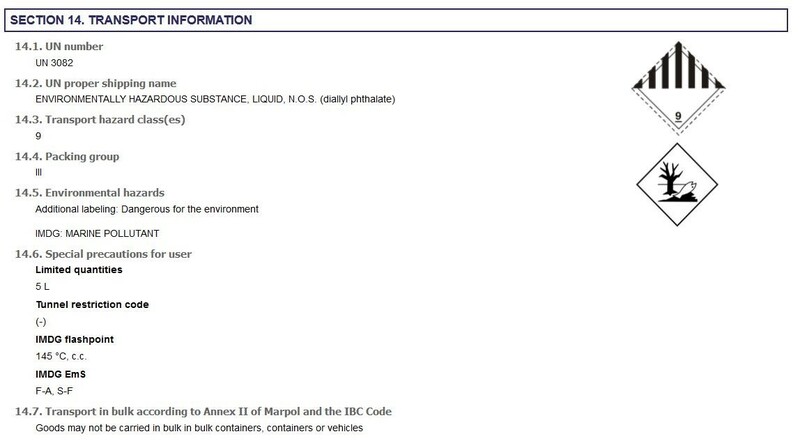 If a number appears in the "ADR UN" column, it is a product that is a subject of dangerous goods transport (as in the following case of Degreaser). 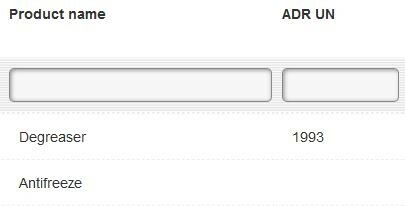 If a number does not appear in the "ADR UN" column, it is a product that is not a subject of dangerous goods transport (as in the following case of Antifreeze liquid).